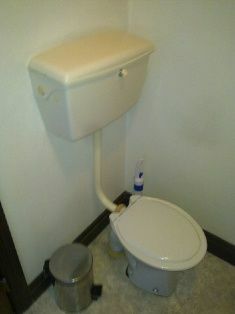 Does your toilet cistern overflow pipe leak out the back wall? 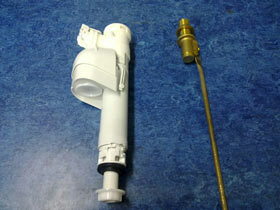 Here are two of the most common toilet inlet valves. This is a common problem where the cistern ballcock or inlet valve is not shutting off. More often than not this is a simple washer replacement. All our vans carry a full stock of all the most common types of washer kits, depending on what type of cistern valve you have, they range from $2.00 – $20.00 plus our minimum charge rate of $70.00 + GST to install. Here at PlumberMan we always approach every job by trying to fix the problem the low cost way first. If replacing the washer does not work then we would replace the inlet valve. Prices vary for toilet inlet valves depending on the model, but the cost would be from $30.00 to $60.00 plus installation. Does your toilet have water constantly running into the toilet bowl? There are generally only two reasons why this is happening; either the flush valve is not doing it’s job properly and is letting water through, or if it is a more modern toilet cistern, the flush valve has a centre overflow and your inlet valve is not shutting off (just like we discussed above) and is overflowing back into the bowl instead of the old system where it discharged out the wall. Again more often than not this can be repaired with a new washer kit with prices for flush valve washers ranging from $3.00 – $20.00 plus minimum charge for installation. Unless told otherwise by our client, when we are servicing a leaking toilet cistern we will always replace the washers in both the inlet valve and flush valves at the same time as we feel the small extra cost of doing this at one time will save you money in the long run. Have you found water on the floor around your toilet? There are many reasons why you may have water on the floor. Usually it’s from a leaking cistern tap or perished flush pipe seals. What ever the problem PluberMan can diagnose and repair it for you. 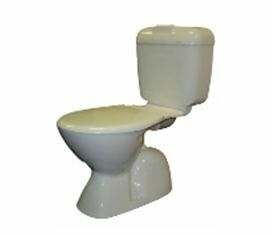 If you are tired of looking at your old toilet and feel it is time to upgrade, we can arrange a replacement that best suits your budget. Whether you just want a new cistern or a complete suite, the options are endless. 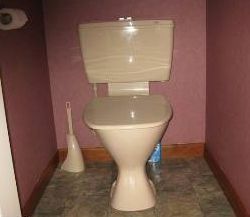 First we will look at the old Dux high level toilet suite which is a very common toilet found in older New Zealand homes. High level means that the cistern is connected to a long flush pipe and the water inlet is up high next to the cistern or in the back of the cistern. To replace these types of toilets with the new modern range of toilets you will need to have your water inlet tap shifted to a low level position. If you would rather save hassle and cost of moving your water inlet you can just replace it with a new high level suite as seen below. Here is the typical old Dux high level toilet suite. To replace your old Dux high level suite with this would cost $377.81 + GST installed. 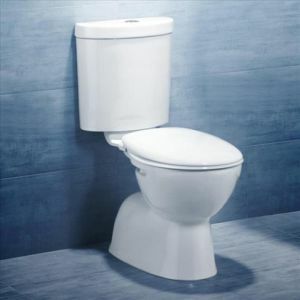 Or if there is nothing wrong with your old toilet bowl and you just require your cistern to be replaced we can do this from $211.46 + GST installed. 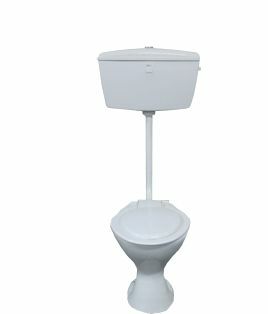 Low level toilets are much easier to replace with the new modern range of toilets available than the high level type (as discussed above). Depending on your budget, whether you are after a simple entry level upgrade of your old toilet or want something special, PlumberMan can sort it for you. With one of these entry level Marsden Universal plastic suites from $396.05 + GST installed. 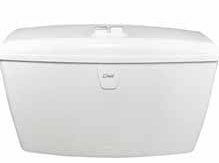 If you are after a mid range toilet suite with both vitreous china toilet pan and cistern we recommend this model – Caroma Profile 4 Connector Suite. This could be installed in your home from $474.30 plus GST. 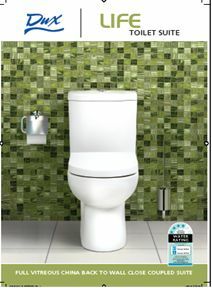 This is a good quality completely “back to wall” toilet suite by Dux Industries. To supply and install in your home would cost from $709.58 plus GST. The price indications above are accurate for a straight forward swap from your existing system. However if the measurement of the centre of the pan connector back to the wall is not in the installation range of the particular suite it may need to be adjusted. We suggest a phone call to us to discuss and perhaps an initial site visit may be necessary.